Interview conducted by Sandra Schermerhorn, Sa bom Nim. Could you give me a brief summary of your training history, your instructors and the places where you trained? Starting from when? Well…You first trained in Korea? Did you? 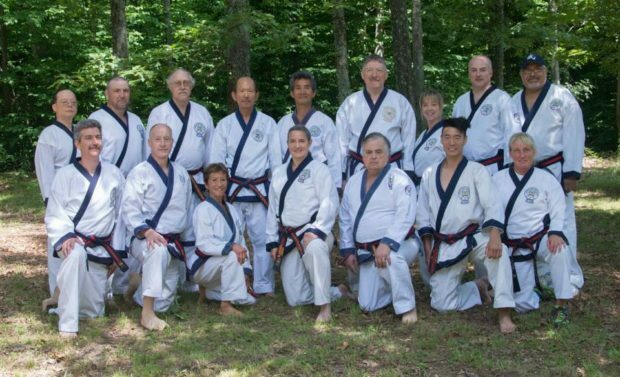 I Joined the Moo Duk Kwan when I was stationed in the military (Air Force) and I started in October 5, 1970, that is when I joined Moo Duk Kwan, when I was stationed at Osan Air Base, in the Republic of South Korea. Who was your instructor there? 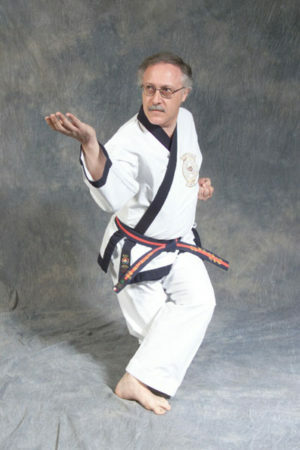 Master CS Kim, who currently resides and teaches in Pittsburgh. He is not with the Federation, anymore is he? Not anymore. NO. Did they have other instructors there, or just Kim was the main one? He was the main instructor. There were always seniors that assisted both as instructors and in general, seniors training, teaching and doing what seniors do. There was_U Ku Won, e you quan, Lee Ki Yun, was more like my partner, Lee Ki Yun, was also one of the senior master instructors there. He resides in Southern Jersey at the present time near the South of Trenton cherry Hill area, south of the cherry hill area and then one of my other seniors was Cha Ton Yi who resides in Cinnaminson, New Jersey. You maintain contact? I know where they were. All of them, At one time or another they were all part of the US Federation and they were in the Federation system. Was this Do Jang the one that is in Seoul now? No. this was in Osan, which was actually on the base in Osan Air Base which was about maybe a half an hour south of Seoul. Where they’re mostly Korean s who train there or who was in your class? On the base there was mostly GI s. because it was a Military installation facility that the only US military personnel merely trained there. What was the training like there, compared to now. Perhaps people train now or what kind of training did you do? It was more like rough and tumble. It was hard, it was intense, and it took like 2 hours at least a day. Did you train every day? Every day but Sunday. Really? Everyday. Sometimes twice a day. Classes were Monday through Friday it was afternoon and evening classes and then on Saturdays a morning class. You get off work at 6:00 in the morning, catch about 5 hours sleep, head over to the Studio do the training, go back to the barracks, get cleaned up, get something to eat and go to work. So you put a lot of training into the training. A lot of training. How old were you then? I was in my 20’s. In your 20’s So mostly the guys were probably the same age? From 18 to their early 20’s . The majority of the military personnel that were interested in that kind of thing. Do you have a favorite story about your early training? Not really. Ok.
During your training years, where they’re any major changes? What do you mean training years, I’m still training…? During your training years. I know yes…that’s why we want to get this information, this is all good for us. Obviously, you have some major changes in your training, started in Korea, changing instructors, changing schools, where there any other major changes in your training, any setbacks due to illness or injury or jobs or anything like that? No. I was just consistently training. How was it? It is interesting to note that it started in Korea, I would have thought it was have been easy to stop, but you continued when you came here. It’s always easy to stop. You know it was like… you know I was a new Cho Dan, so like ok let me do some training and find out what things were around, and look in the phone book or you would call whatever source of information you could find, and you see who is around. You know and sometimes you find someone you like sometimes you don’t, you know I had been to a couple of schools that were ..supposedly, well there were actually teaching tang soo do but their understanding of it and I wasn’t exactly happy with it and their approach to it, so…I didn’t go to them anymore. 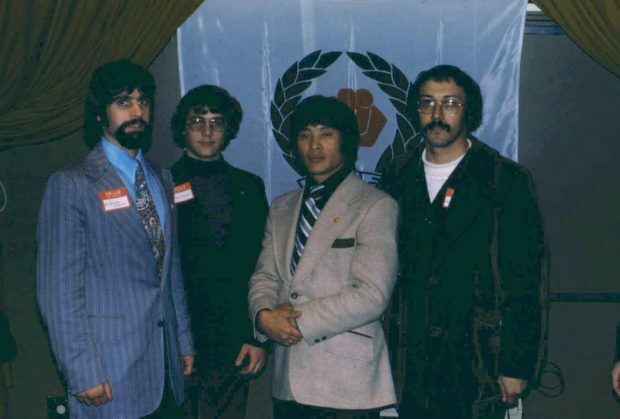 And it just so happened that I got a magazine, one of the few magazines that advertise Tang Soo Do, and there was an article about Jae Chun Shin and he was in the Southern Jersey and back then it was Burlington New Jersey, so I made the trip, first I made the call then I made the trip. That was some trip for you, wasn’t it? No about 2 hours. It was once or twice a month we would go down there on a Saturday and do some training. Was it called Tang Soo Do in Korea also? Yes. It was the same thing, yes. So after…when did you end up training with Kwan Jang Nim? I was going down to going to the studio on a regular basis, and then one day I would show up at the studio and I would see Master Kim there. He had just arrived from Korea, and said this was great, I could see my instructor again, and do some training. We had good training relations and maintaining that student – instructor connection and then right around that time maybe a year after, Kwan Jang Nim Hwang Kee he wanted all Dan members to get together to really form a strong organization in the United States so he asked Master Shin to call a meeting of all the Dan members that he was able to get a hold of and that was held on November 1974, I believe, that the meeting go to Burlington New Jersey from which an added discussion was done on that weekend and hence a task force was formed to basically create the charter of the Federation, as was to create a Federation based upon everything that we hold dear, and wanted to ensure that we move forward and to continue the organization under the guidance of the founder. I see. So you were a Cho-Dan at that time? I was an E-Dan at that time. You got your Cho Dan in Korea. Yes. Did they have a test like we have now to get your Cho Dan.? Where there many masters watching you, or who watched you? Now you’re getting into the nitty gritty. Who judged you, like the master’s people? Yes. There were several people that were there obviously, my instructor was there, because he brought us up there. He_was there, another master instructor was there and my current instructor was there. And the person on the board was actually observing and scoring us. Master econ ukun and he are no longer with the organization, but he lives in England. I don’t recognize that name. They used to call him “international tang soo do of England”. He is no longer with the founder. Inaudible section. He has also worked Atlantic City International Championships back in 1982, I believe, he was there, as well as many representatives from around the world who were able to attend. How long had you trained before your dan test? It used to be shorter than now, wasn’t it? A lot shorter…well it was shorter, yes, It all depended on the proficiency of the person, and because….. the course of training was more intense, people got prior experience and they also advanced ahead of time, so it depended on the individual candidate. I see. Did most people go to 2 hours a days 5 days a week. Was that pretty much standard? No. The class was… The actual class was 2 hours, whether it was an afternoon class or the evening class, it was 2 hours and even though on the sign it said 3. I don’t know. It was definitely 2 hours’ worth of training. I went to some of the them in like Master Cho’s at Madison Square Garden, when Robert Boudawin, when he was part of the organization and used to go to his tournaments in Connecticut. I went to one of his… he used to hold two tournaments in a year. One in Waterbury, in the fall and then one in the spring in another town not too far away from Waterbury. So I used to go and support him because he was a good practitioner as far of the organization. You know. Do you have any favorite memories about tournaments, anything that sticks out in your mind? There are a couple of them. The most memorable was at one of the open tournaments, I actually attend, but I didn’t actually participate in. Actually, participated in as a … participant yeah that’s as good was any word. There were many flamboyant people who had a variety of techniques, where they were acrobatic or traditional. A lot of times some of these flamboyant acrobatic people would win the tournament and until judges woke up. (inaudible) The acrobatic persons are happy and everybody else was. That’s interesting because when I came in I thought It was traditional. I did not get to see that, but that was like a break through. A turning point. They did things like back flips, a couple of punches, through you on the ground a couple of fancy kicks. Whatever… That is not really traditional in the sense of what we are seeing as a traditional form. It may be traditional in your studio, but as a general martial arts format, it is not. In your years of training, what were people’s attitudes toward the martial arts? No. They called in basically, specifically when you are in the military, and you have nothing else to do but go out and drink, it was something to take up the time, so that you don’t become an alcoholic or get into trouble doing other things, so it was an avenue for creativity and would keep you out of trouble. Right…Right… Besides it was for…. you were able to protect yourself. How about family or friend’s attitudes toward martial arts? Did people think it was a good thing? Or your buddies, did they think it was a part of their training? It was a mixed bag. Someone would try an amazing move. Someone would say, you know that is good, that’s fine. Someone would always try to get to get me into trouble. Let taking me to a bar and say I know this guy can take on everyone in here. You are not going to do that. You are not going to take me to a bar. (laughs) you know…they were busting my chops. You know I can’t do that. In your early years in training, did you have any heroes? Anybody you thought was “real cool”? You could always say Chuck Norris was really cool, or until we say Bruce Lee was really cool, they had their place as role models for people and something to help bring the martial arts to the public eye even better, then watched previously through the various TV shows and movies and things like that. When you don’t know any better you only have what we have to see, to give us as a sample as to what would it would be to be in martial arts. There are a lot of good martial artists out there. Each one of them has their strengths and weaknesses. Among them, Kwan Jang Nim. He epitomizes what a true martial artist is. Soft spoken, calm, but don’t get him mad. It‘s not like a lot of friends would say, he’s takes karate, yeah…how come he doesn’t have any muscles? Martial artists doesn’t have to look like Hercules. He has his strength from within and through their training the technical expertise and the technical strength, not necessarily a muscle bound physical strength. That’s what really sets a martial artist apart from a bar room bawler whatever you want to call it , fighter…so…fortunately I’ve never had to use it…avoidance avoidance! Awareness and avoidance… yes. Right. I never really thought about it. I just like to train. Right, I see. Honestly when I first came back, it’s like oh…cho dan, yeah this is really good. And all of a sudden, its edan, ah… yea edan…yeah that really nice, ah man that’s really good. I could learn a little bit more, then sam dan, etc. etc., etc, etc. I never thought it would last this long. I never thought I would stay in it. For me it is something I enjoy. Right so kind of looking back its like wow…it’s been a while. Right, right. Talk to me about your Cho Dan test. Where was your E Dan Test? Was it in the United States? 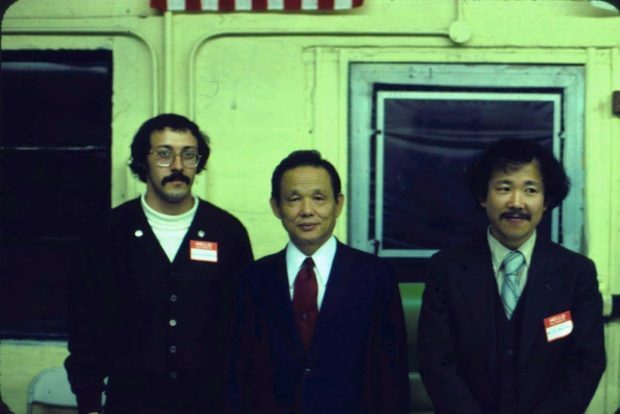 The Cho Dan test was in old famous HQ studio in Seoul, and all the other tests were here in the United States. United States? 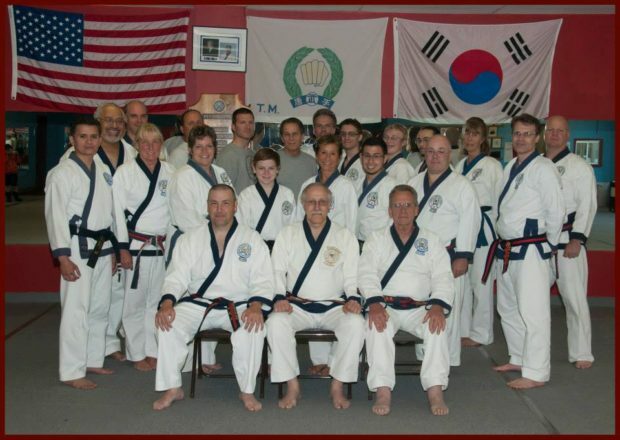 The second Dan test was in Burlington, New Jersey, under the guidance of Master Jae Chul Shin. 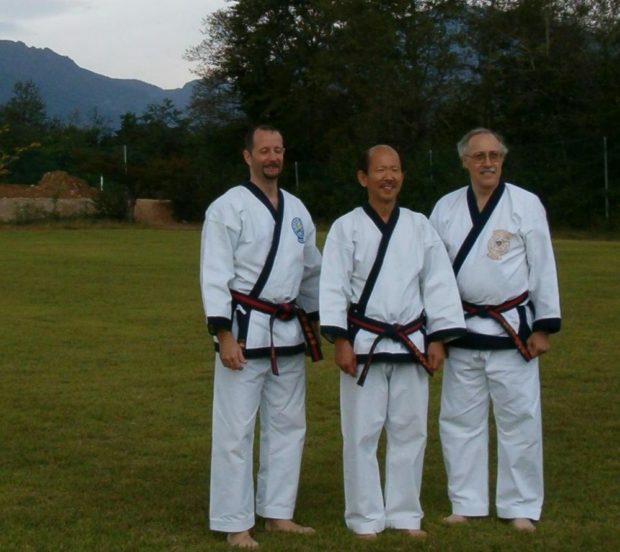 The 3rd Dan test was under H.C. Hwang Sa Bom Nim, then H.C. Hwang. 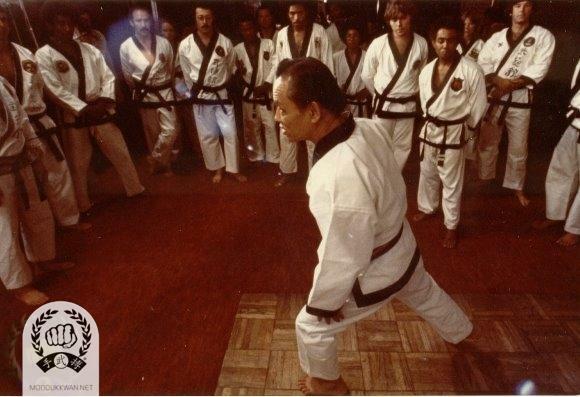 The 4th Dan test was again under H. C. Hwang Sa Bom Nim., at that time. Where was your 4th dan test? Springfield studio! was it? At that time …it was part of a day test. It was part of a regular test. When did it all change? I don’t know. I am not sure exactly what year it was. Back then there was actually, it was in the newsletter, actually …it was Master Yong Ki Hong, In Ki Hong, testing for the next ranking. Which would ah… I forget what they were going for… but Mary Ann Walsh, Sa Bom and I tested together for 4th. Have youtwo always tested together? We’ve always tested together since, its just one of those things, your testing partner, yes. 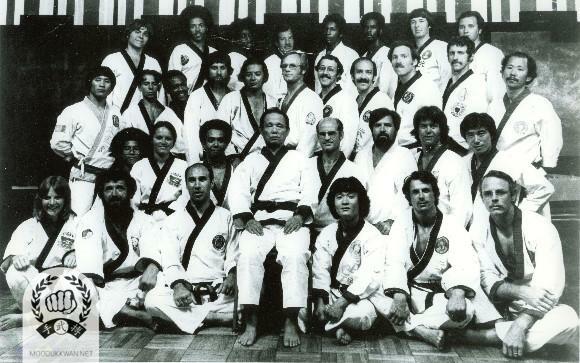 When I tested for Cho Dan I was one of 6 or 8 people. —one of the was Korean (Name inaudible), and there was Charles Moore, Ver——————–I forget what this other man’s name was, he last name was ____________myself and Donald _____________since then has changed his name to Darrel Cody., he is out in Arizona some place, as far I know Darrel no longer trains. Steven Humford, he was the other one. Were these people all about the same age? Yes, we were all about the same age. Do you have any favorite stories from any of your Dan testings? Something that sticks out in your mind? 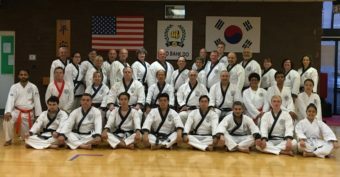 The 3rd Dan Test. When I and joe Markovetch. We are up there during the endurance kick, it was like , when is this 30 seconds going to be finished! Unbelievable. Then Sa Bom Nim Hwang had to stop whatever reason, and then he had to start again. We did not move. The audience were not moved. I was embarrassed. My body was saying no. It was an accomplishment. It was interesting. I don’t remember why exactly he had to stop, and start again, but not too long, well, we both passed and to retest after a while. I don’t remember if we had to do a retest or whatever it was, but then we got our certificates at one the Burlington tournaments. Boudenwin he got his 5th Dan certificate I think at that presentation. Markovich and I got our certificates, I think Art Pryor got his either 2nd or 3rd dan , I can’t remember it was a long time ago. I will have to look at the videotape. It was a long time ago. Back then certificates two separate. The larger certificate which was even larger in size then what we use now, was all Korean and then you would get a smaller one and it would be strictly in English, so I have my 1st, 2nd and 3rd Dan Certificates were in that format and then the 4th Dan came along, it was right around that time period which is when they combined both of them into one page. Just to go back to Korea then, the belts, what did they were in Korea? Just like what we had here. No stripes on the belt either. For the people in that studio, you worked with the senior. It was ok for the studio I guess, but it could cause more confusion when you go to a demonstration or another kind of gathering. Where the uniforms the same? White belt trim, green belt green trim, etc. NOTE: This is where I started to transcribe the last portion of the recording, no grammar changes have been made yet and I typed as I was listening so there are gaps, which I will go back and add correctly. Looking back… grunting in the background. A group photo on base in South Korea, after demonstration, after I was a Dan member, inaudible…we had done a demonstration, there was a group photo it shows a lot of history there. Fond memories from that time tribute. And then one of those gentlemen his name is John Delapea, who grew up in Kingston, New York, he traveled the world around, through the military, he is my personal senior out of Osan airbase. I haven’t seen him in what will be 20 years. 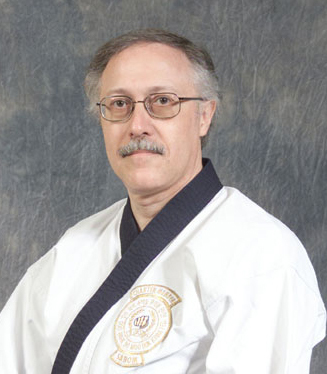 Master Donald southerton said that he had heard from a person in Florida, that there’s a tang soo do practitioner. I said who was he? He did not know. But knew someone at one of the military air bases in St Petersburg area in Florida, he’s going to find out from him and tell him that if he is John Delepea. I said calmly, you get me his phone number. He got it and I made contact after around 20 years. Oh my…! We still stay in touch. He is a very unique person. He was actually translating the old MYDBTG into English on his own and he stopped after the publication came out. It is basically correct, except for some errors, which I am not going to bother to publicize. He learned Korean in the service, Yes, He was a Korean Linguist. He actually works in translating. What branches of services would call he would hear the broadcast from North Korean and translate it, Give it to Korean military or officials to disseminate to whatever details … to Koreans . He was Korean linguist. Almost like a Korean CIA type of thing. He was that kind of thing. Continuing with our interview, we are starting up again after our break, sir is there anything you that you thought about during the break that you wanted to mention, would like to mention? No. As compared to? , what we do today, I know you mentioned your training was two hours long. Fb:Yeah, hmmm, In my experience, there way it was done, when I was coming up from ranks, the colored belt ranks, we would , ahmm…we do in the gup ranks, we would do every hand technique that we knew, then we would do every foot technique that we knew. Then we would every form that we knew, at least twice, we would do some one step sparring, some self defense, because we really didn’t stress it as much, or in the ahhh….we did one step sparring but we didn’t really do self defense as much, that wasn’t stressed as much, and we did a lot of sparring, a lot of sparring, so did that take up an hour, a lot of sparring, no… it was just about equally divided throughout the two hours, so if you did something like han da maki, you did han dan maki, you did it up and down the deck, up then and return and back, san da haki, up and down, inside and out up and down, inside out up and down, middle knife hand up and down, middle punch, up and down, side center punch up and down, front punch, reverse punch, any of the hand technique we knew at our level. …we would do it up and down the deck that could be 20 repetitions, 10 up ten back, for argument sake, then we would do the kicks, front kick, side kick, round kick, back kick, jump front, jump round, jump side, jump back, all the ones that we would know at our level. And ..but there were seniors in the class, they would be doing theirs, while we would repeat what we already went over. That way everybody is doing the same type of thing. So everybody would be doing hand techniques at the same time, everybody would be doing foot techniques at the same time, and after that we would break off into doing our respective forms, yea… a couple of times; all depends on whether you were relatively proficient in it, if not we would do it again. And again, and again. So repetition was really stressed, yea you get a lot of repetition, and then one step sparring you would …make the circuit. If there were twenty people in class, you did one step sparring and you’d meet every person. Like there would be …if there was 20 people in the class and one person was the senior, everybody got to meet the senior. Sounds like it was pretty fast paced class too? Ahhh… could be…laughing out loud, did the instructor talk less than they do now? Way less! Way less. So…it was just demonstrate and follow? Demonstrate follow, if you needed some instruction it would be explained to you in as simple terms as possible, because back then a lot of the instructors, the Korean instructors especially their English was not that well. And as time progress you know it got better obviously, as you would do with any language as you use it more and more, it was like do this, and do that. You know it was demonstrated follow. No, its not right do this…so… and it was done with 25 words or less. You know they didn’t… ahh… repetition, that was it. Did you have any pads to work with? Oh no, no.no, no. Pads? Surely you jest! No such thing as pads. That’s what your forearm muscles are for. No I’m kidding, No Pads, No pads. And in terms of targets, did you have any kinds of targets that you used? Yeah a person’s nose. Each other? Yes… Some..you know we would have things like you know cardboard, squares and stuff like that. So that way you could work on specific techniques, without injury to your partner, who was helping you but…none of the fancy targets they have these days. How about when you broke? Did you break wood? Wood, roofing tiles, those of us, my seniors especially, they could do bricks, I never got into that part of it at this stage of my life I’m not about to start, and that’s the way it was. Looking back over your training, can you describe one of your best times? Only one? You can pick a few…! (laughter) Ah…training? Or it can be your experience otherwise….you know if….whatever involving the Moo Duk Kwan? Some of the best times was when I was training with my instructor and he would be my partner. And I’d be smiling…and he be …”why are you laughing at me?” I’m just happy to be training with my instructor, its good, you know, just getting out there and being active and train its just…its like … there was a practitioner and I don’t think he practices anymore…his name was Harry Rainer, he was part of the Don Southern group at one time. He said.. I’m just happy doing Han dan maki, I’m just happy getting out there and train. Yeah. Fancy stuff, non fancy stuff, it doesn’t matter. I’m just happy to be out there with my friends and colleagues, whatever you want to call them, everybody else ..that’s Moo Duk Kwan and train. During your time of training was there a really a hard time for you? No not really. Not that comes to mind at this point. Maybe there was and I subconsciously blocked it out. But I …I can’t think of anything at this point. Yea I guess, you know what I’m thinking in terms of how did you get through hard times and I think maybe you’ve already said how good it was to train with your friends and training. Well you know, I have to use other people’s words because I think that bring out the spirit of the martial arts. Master Jae Chun Shin said… “we practice in the hottest weather, and we practice in the coldest weather, doesn’t matter what kind of weather it is, extreme heat, to extreme cold, so that way when the weather is just fine, you’ll feel great.” So when he’d turn down the heat in the winter time, they’d turn down the air in the middle of the summer, what would they do if there was no air conditioning, if air conditioning was not invented? Or if all they had was a coal or wood burning stove? Which in some parts of the world, they still do. You know. Central air, central heat, we have luxuries, but that was then and this is now. So we enjoy the luxuries, we use the luxuries, and we keep training. We talked before after a favorite photograph…I was wondering if you had any treasured item from the days of training? Treasured item? I have my original green belt. Your original green belt? Ahum…(affirmative)…I got my first dan uniform. Were they heavyweights ? No ! They were between a light and a medium weight. Not compared to now. Well I would call a lightweight, nowadays they would call it a medium weight. Because manufacturers have a tendency to change things in their manufacturing nowadays. Into what they would call what it really is like. But it’s not like the old heavyweight uniforms that weighed a ton and they were like hard to iron also. It’s not like those. Like equivalent to a middle weight I know I won’t fit in it now it got shrunk through washing and drying and stuff like that, but I still have it. Did you iron it? Oh heck no, I never ironed, people just wash them and dryed them and… Back in the military we had help in the barracks. Oh So, it would get ironed, oh yea it would get ironed. But we… I try to iron them nowadays on occasion. When I’m ambitious about the ironing definitely not the ahh… it’s gotta be 100% cotton …that 50-50 mix, doesn’t feel like a uniform. Well that is a treasure… and the green belt…I also got my original gup pins… oh …what do they look like…? Do they look like the same ones we have here? They were basically the same as we have now…they only difference was that as a green belt…where the writing is for ahh…back then it was Tang Soo Do, where it says Tang Soo Moo …it was green filled, Oh really… and as red belt it was Red filled. And Only your dan member was blue filled. So that different ones for the different ranks, yeah…I don’t know if that was a local thing, studio thing, could be but that’s what I got. That’s One of my memorabilia. And that’s nice. Great. Let me stop this. Ok, now…I’d like to ask you about some of the famous people in the Moo Duk Kwan. When did you first meet our founder, under what circumstances did you meet him? Chang Suhl Ja Hwang Kee? Yes. Osan Airbase Korea, 19…it was either 1970 or 1971, back then the nonmilitary people more specifically the non-us military people could not get onto the military base. They had to be signed on so that way they could come onto the facility. And at different points in time, different people would perform that function. And that’s how basically we first met. I signed him on the base, when I was requested to go down to the main gate say ok this person can come on. And that’s how I first met him. At that time period. What was your impression of him? Quiet man, I mean he spoke no English, I spoke no Korean, but several seniors who said alright , you need to go here you need to do this…I went down and sign him on and they escorted him back to the studio… so that was to my experience with him you know seeing him on the OnBase studio. Did he teach a class then? Or watch a class? Basically, he watched classes, visited and was able to see the instructors. Did you have a favorite time or training situation with you and him? Any story? With who? Our founder. Charter convention, What happened there? 1975 June 28th, he conducted the training seminar and that was to my recollection that was the only time I saw him… that was the first time I ever saw him in uniform and actually officiating a function. And he taught a class? Well he was there… and H.C. Hwang and C.S. Kim actually taught the classes, but he’d called, our founder would be there and would give words of wisdom, stressing certain points, giving certain examples, of what the people should be doing and should not doing and I’m sure that was all that charter convention was at one of the nationals in the historical room. Oh ok.
And did he sit in on all the meetings? Oh yes… He did? He sat on every board meeting that I’m aware of. Did he have much input or he listened? He listened, he… translations were given to him of what was going on, and he’d give an opinion or something stronger, hmm…as needed. That’s from my understanding not, from my experience. I see. I see. Oh You weren’t at the meetings? No not at the board meetings. I see. I see I see. He was at the initial meeting that I was at on the charter convention meeting, after that I was not at the board meetings until I became a board member. I see. And you… how long have you been on the board? Probably about ten years. Ahh ha… I see. Somewhere around there. Hmmm… Kwan Jang Nim H.C. Hwang … Yes? When did you first meet him? April 1971. And under what circumstances was that? Or was it March 1971, I don’t remember, it was somewhere around there. We were doing a demonstration in Seoul, took the bus up, a bus was provided for us to up to the 8th Army Retreat Center in Seoul, we did a demonstration outside it was my first demonstration and the first time I saw him. And was he demonstrating then also? Oh yes, he demonstrated Kong San Kun, he helped with different people demonstrating and he demonstrated …he actually did some free sparring with one of his students that I recorded on my Four A and super 8 film. Do you still have recordings that you have from back then..or…Oh yeah. Oh…! Now those are treasures too…wow. Oh yeah, that was part of my history… YES! And did you remember what you demonstrated at the demonstration then? No I was behind the camera. Oh you were filming. Yeah. Oh.. what rank was he then, do you recall ? Oh… he was Ko Dan Ja …so…he could be 5th could be 6th…there’s no way of knowing…I see. Do you have any favorite stories about training with him or being with him at events? There’s no favorite cause they are all good. Could you tell us one, no… or two…? No…ok. Maybe at another time. One other question about people. 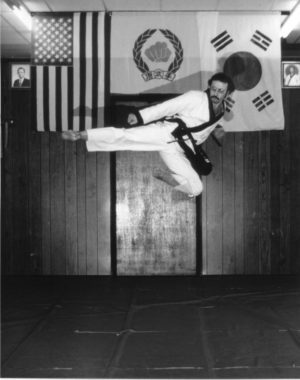 If you had to choose the most memorable person, besides the two we’ve already talked about in your training time in the moo duk kwan who would you pick, and why? Why were they memorable? That’s not fair, because there are several people that fall into that category … I can’t…to pick one of them…would not do justice, would not be fair to the others because they all have unique properties, unique characters, unique abilities, hmm… Master Seiberlich, Seiberlich Sa Bom Nim, Hanke Sa Bom Nim, Ahpo, Master Ahpo, Martinov Sa Bom Nim, Joe Markevich, Daymon Kenyon, Jan Seo, C.S. Kim, Kyo Nee, Don Machakobee, Frank Schermerhorn, Mary Ann Walsh. They all contributed to your… Shipley Sa Bom Nim, Ben Cortese Sa Bom Nim, Wilton Bennett Sa Bom Nim, the list goes on and on…. I just… I can’t. it’s…I can’t. Ok.
How about in teaching, what do you like to teach? How? What do I like to teach? …How to get the person to do the techniques correctly. So that way, it seems effortless. A lot of times, and I deem this, I’m at fault also, as human beings we sometimes in a rush a lot of times we are in a rush, but if you don’t have the right understanding in how to do things, you get to shortchanging, and we probably could get away with it in a certain amount of time but for the long run if you really need the perfect technique at a specific time it’s not going to work because you shortchanged it by not doing it right or as right as you can working toward the perfect technique all the other previous times. Just like self defense techniques…how effortless is this (demonstrating) YES! It doesn’t need a lot of work or a lot of effort. Effortless. But if you know what to do…and work toward perfecting that technique so it doesn’t you know it takes no work at all…then the possibility for success is greater. Is there a motivational story or a story with a moral that you like to tell your students? There is not one…it all depends on the students what’s happening at that particular point in time. So I can’t really …there isn’t just one. Is there anyone you’d like to tell me now? No.. Ok, another time. Another time. Ok .
What is your personal training like now, do you get to train occasionally? Well… physically or mentally…. either. mentally I always train, because I’m always thinking about doing techniques. Physically I think about…well physically, as I’m teaching sometimes I’m also doing it with them, with the students, so I get my personal training in to a certain degree. Then I’m always thinking about utilization of the techniques, how am I … what does this technique do, how can I use this. From a simple hand an maki to the most complex, I imagine actual utilization as I go up and down the deck. And I have to give credit to Master John Delapia, because he instilled that in me, when I met him after twenty years, based upon on his research, what are we doing in all these forms? How can we use these techniques in actual combat? What are we doing? You know to me …doing the technique, I was just happy doing the technique. But he gave me a little bit extra to think about so maybe that will help self-motivate to go to another level. So hand dan maki could be just a little bit more than hand an maki, anheso pakuro… whatever, whatever the technique happens to me, could be a little more than what it is…, or could be just, what it is. All depends what the need is at that particular point in time. Ok. Hmm I guess that might explain your approach to training changes over the years and now. Yeah. 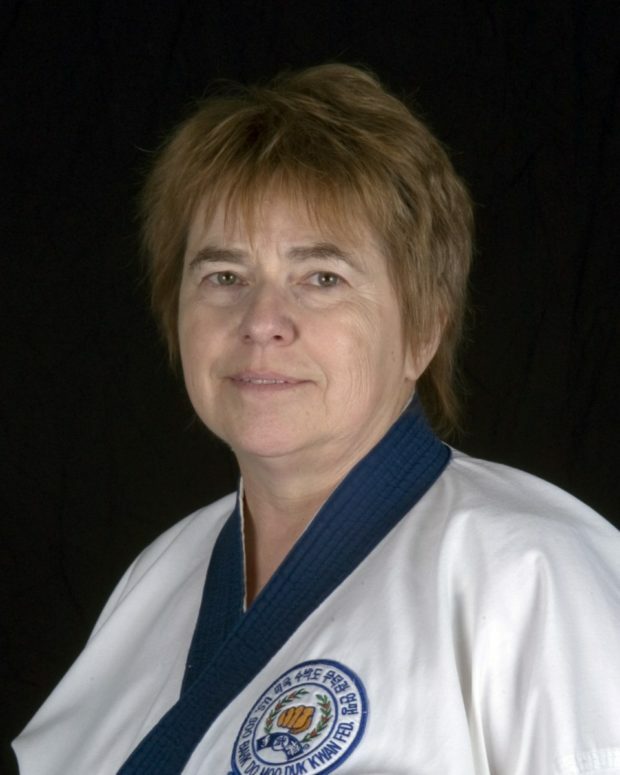 When you look back over your training years in the moo duk kwan there must be many milestones I’m sure, is anything that stands out very satisfying for you, something that occurred that was really satisfying? It’s all satisfying. 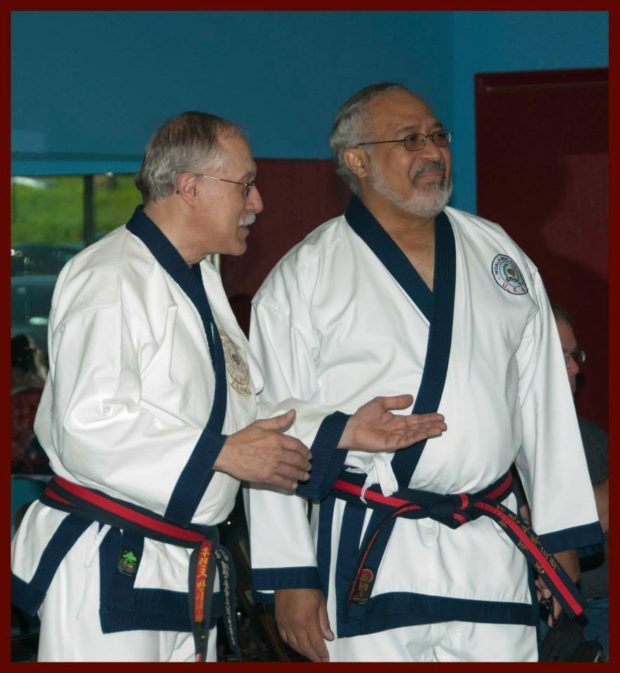 Inaudible, the changes that have gone from tang soo do to soo bahk do? Well in reality, soo bahk do was the name of the organization in 1960, so we were really soo bahk do from then, even though officially that term was not reinforced or whatever the right adjective was until much later. 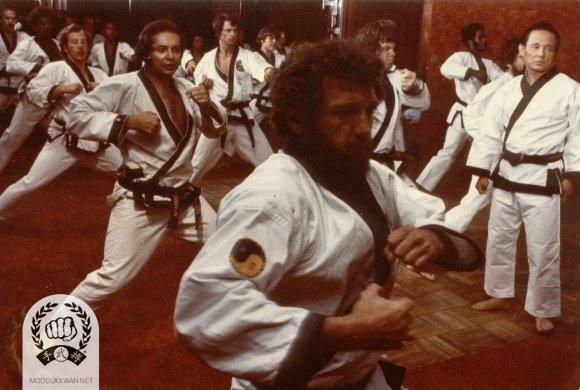 Whether you want to call it soo bahk do or tang soo do or Joe’s Karate or whatever; it was the Founder’s philosophy that really guides us, the martial spirit without some of the aggressive tendencies that some other martial arts have the tendency of doing but we must not forget that it’s a martial art first and foremost. It was built for martial skill because in generations past, it actually had to be used in combat. So, people may say this, people may say that, and it has a variety of purposes depending on what the individual person wants to do, you know want to use it as a social gathering, it’s there because it’s a group, you want to use it as self-defense, its automatic. You want to use it for self-control, it’s there, when you want to use for weight control, you want to use for tension relief, it’s …it’s all there. Or it depends what the person wants, what the person needs. I think I answered the question. Oh yes, did I go off on a tangent, maybe, I don’t know…No… looking back would you do anything differently? Probably not. Maybe yes, we’ll have to get back to that one…Ok. How do you feel about being a moment from now, being one of the senior ranking people in the Moo Duk Kwan? I’m just a practitioner. In fact, now that I’m in a position, well what should I say, it’s one of those things. Just like thinking, you know, would I ever have been it in this long? I never thought in my wildest imagination that I would stay here this long. But it’s something. If it wasn’t for people like my instructor, and my former instructor, and the seniors that helped me come through the ranks to at least Cho dan, I probably would not have stayed. 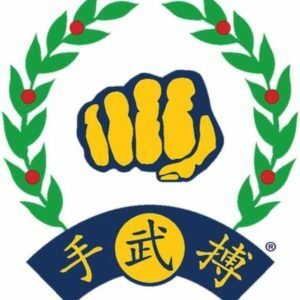 It is because of the people, if you don’t have good people in the organization, then why bother staying without encouragement, go to another martial art that keeps teach how to be a street brawler, you know. Do they have value? Yes. But it’s the charismatic personalities. And the nurturing of the instructors and the seniors that will be…ah…make or break whether a person stays in an organization or not. Am I sad to see a lot of those people not in the organization anymore, yea… because they have…still have a lot of good value but, it is what it is. And I was going to ask…an important thing inaudible … between senior to juniors, you said the nurturing is so important, to people, that you seriously nurture the juniors, is there anything else you think is important for the juniors? Be firm. be fair. be strict, and make sure they are on the right path all the time. Like …. 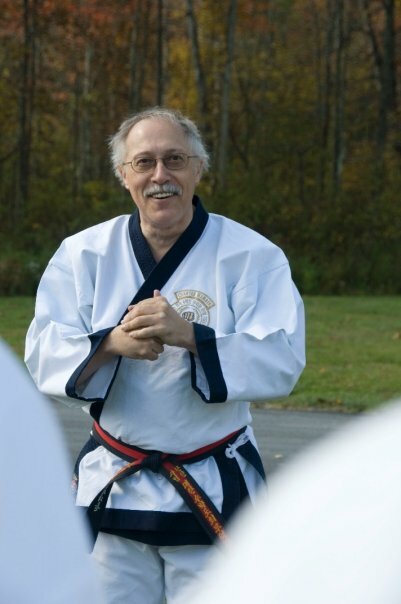 like if you don’t teach the person the right way, well here’s a funny antidote…if that’s the right term; there was a practitioner, who got into a street brawl, he was a moo duk kwan practitioner, he was supposed to be pretty decent. And I knew him for a short period of time when I came back to the United States, and he told me that he had gotten into a street fight; and he was told if he did this specific technique, that he would kill the person that he got contact, so he used the technique; and of course, the person did not die. So, he went back to his instructor and said …. well you told me if I did this technique, I’d kill the guy, I mean he was after my blood, and I did this technique and it didn’t work…and the instructor said … you didn’t do the technique right. Now…that’s an extreme, but as instructors, if we don’t teach the person right, we just collar the person, and say yeah, you’re doing a great job… don’t, worry, yeah fine…you’re building a false sense of security, you know, I’m not saying that you have to take a stick and beat them over the head, or on the backside, or anything like that …but, there are ways to be firm, be fair, be strict and you know, make the person go to the level, where they should be. So that way they can go if they have to be a in awkward situation they can handle with confidence. What you would like your juniors to know about you? Or how would you like to be remembered? Laughing… Inaudible … what would I like my juniors to know about me, or remember me for? Oh, the list is long….no I’m only kidding. I guess I’d like to let them as being a fair practitioner, one that contributed to whatever way I could the Moo Duk Kwan’s being more publicly known because of my assistance with the helping with the publications. Between my cousin, let us use his photography lab equipment and a friend of mine who helped with the photography and we basically took the pictures for volume 1, 2 and the instructional guides. That was lot, yeah, especially when I had to develop all the pictures. and print them. So, you know that plus, you know some of the other publications that our founder then, the Korean 2nd Soo Bahk Do, that’s the Korean textbook, the Yuk Ro and Hwa Sun, and the Ship Dan Khum forms …you did the pictures, for that one, for that one also, yea. Ohh…. It’s was important, it was necessary…so. Hopefully they’ll get the names of the persons involved in those publications and say. we appreciate what they did. Yes…that was a great amount of work and …so valuable. You know you were talking about translations, and you know I’m just talking about pictures. Because translations are a totally different thing. There’s no way I could do any of that stuff. The pictures are wonderful. Is there anything that we haven’t covered that you’d like to share? I don’t think so….not that I could think of at this moment. Alright…well thank you very much. You’re Welcomed. 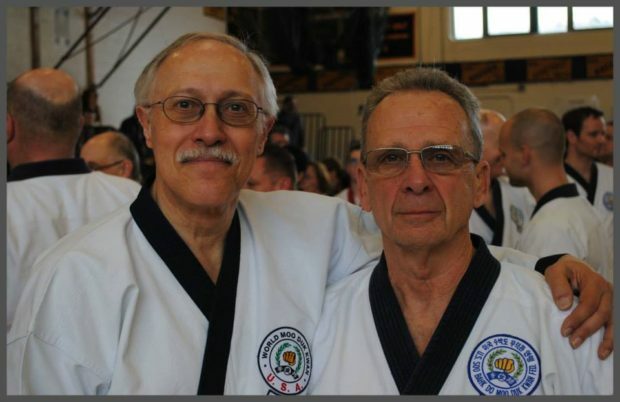 Frank Bonsignore Sa Bom Nim was promoted to 9th Dan on 1 June 2017 at Moo Duk Kwan Headquarters, Springfield, NJ by Kwan Jang Nim H.C. Hwang. 9th Dan Promotion Group photo at MDK HQ 1 June 2017. It is not a complete transcript, I asked Schermerhorn SBN about having a full transcript and she did not have one. So I’ve started to re-listen to the audio and trying to do the corrections as I go along, again, a long process. I’ve stopped a few weeks ago because of an operation, hope to start it up again next week. I have about 20 to 26 minutes left on this transcription. I need to get with Bonsignore SBN to get the correct Korean spellings of some of the Masters he trained with back in 1970 at Osan Air Base. I need my brain flushed. Ok, finished this transcription, still needs to be edited for accuracy, I wrote Bonsignore SBN to help me with the Korean names he mentions in his interview. Added some photos, will look for more that relate to the time period he mentions.